Here is an interior shot of the Packard. The Reo probably had the same interior but covered in doe-skin. I'm going to leave the current interior alone as it is in good condition and the 40k or so it would take to refinish it to original will need to wait for the full restoration. John, bodies are practically identical. The only differences I can see is the molding on the cowl to match the two different marques. I did notice the trunk rack! However, the picture/drawing of the Reo from 1931 does not show one. That is why I'm stuck on what to do with the rack. I would rather not put it on the car. Here is one of the three Packards restored. A.J. beautiful picture of the Packard . Would you be going back to the whitewalls like the Packard has ? I agree the Packard looks pretty good with the whitewalls. But I think it might look good sitting on blacks too! I'm still planning on the blackwalls but I did have the slightest, slightest, slightest second thoughts about it. I didn't know the same body was used on more cars, but being so gorgeous, I don't see why not. The Packard is great, but the added appartent Hood lenght of the Royale (because of the painted radiator) makes it even nicer. And just for the record, even though the Twenty Grand may be the most famous Club sedan, I still think this Dietrich body is prettier. Victor, I think you are spot on with your assessment of the Royale's painted radiator shell. It really makes the hood seem longer. I'm fairly certain that the extra 3 inches of wheelbase between the Packard and the Dietrich Royale is in the hood also. I agree that with the painted radiator shell it makes the hood seem longer . 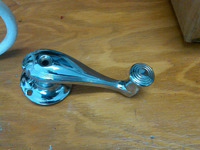 One of the many small projects that I need to accomplish was to recast the drivers side window crank. It had been replaced by a similar but incorrect crank at some point. I got a an email from Bill yesterday that made me very very happy. He found this in the batch of chrome for his Conv Coupe. It looks like his dad had sent it out with a batch for that car. That is what you can call Great Luck! Congratulations. Yesterday I had a rare couple of hours of spare time and pulled my car outside. It is running much better now that the carb has been rebuilt (i.e. disassembled and cleaned). I was particularly interested in the cooling system as I was spitting water when I had last filled it. The good news is that I lost no water running it outside for a solid 20 minutes. I think the fluid loss was from overfill. On an old car I have the owner's manual states that the radiator should be filled to about 1" or so under the top level. I guess in Reo's case it is the same. Every time I fill a radiator from an old car (that does not have an additional tank), at the time of turning the engine off, it spills quite a bit of wáter. I do not refill it and next time I use it it works great without spilling when turning it off. My two cents. I have the same problem with my Reos. I am going to try under filling the radiator by an inch and see if that solves the problem. Thanks, Victor! I was very excited when Charles Hamilton posted to the Reo Royale thread I created in the AACA forum. Chuck's dad Max owned my car from 1960 to about 1980. Chuck has many fond memories of the car when he was growing up - especially driving it around when his dad was out of town.